Our offer of ironer is very wide. We produce two groups of ironers. Professional ironers with roll diameters of 250 and 300 mm and lengths of 1000 to 2000 mm and industrial ironers of diameter 320 to 1600 mm and lengths from 1600 to 3200 mm. In group of industrial ironers we offer cylinder and chest ironers (also multi roller ironers). Our big experience, research inputs, and contact with customer make Lavamac ironers modern, reliable and durable. They meet the needs of even the most demanding customers. 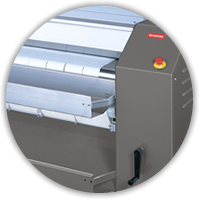 Wide range offers the possibility to choose ironer for any type of laundry. We pay great attention to work safety. All professional and industrial ironers are equipped with hand protection and safety switch. Ironers can be electrically heated, steam or gas, depending on the technical conditions and efficiency of the laundry. 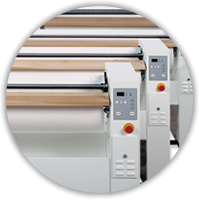 Our designers will always be happy to advise you on what type of ironer to choose and how to prepare the installation.